Two days after his release from Tihar Jail, TTV Dinakaran, the sidelined deputy general secretary of the AIADMK Amma faction, met his aunt and self-appointed general secretary VK Sasikala at Bengaluru's Papparahana jail. Dinakaran drove to Bengaluru with 10 MLAs, signalling that Tamil Nadu's Edappadi Palaniswami government may be in a precarious position, as it has a slim majority of 123 in a 234-member House. The official faction has already made it clear that it will have nothing to do with Sasikala and Dinakaran, sidelining them from the party, as per rival O Panneerselvam's conditions for the merger of the two factions. Among the 10 MLAs who accompanied Dinakaran were senior leaders Thanga Tamilselvan, STK Jaggayan and S Vetrivel. While Tamilselvan represents the Andipatti constituency made famous by AIADMK founder MG Ramachandran, and Jaggayan the adjoining Kambam, Vetrivel represents Perambur in Chennai. 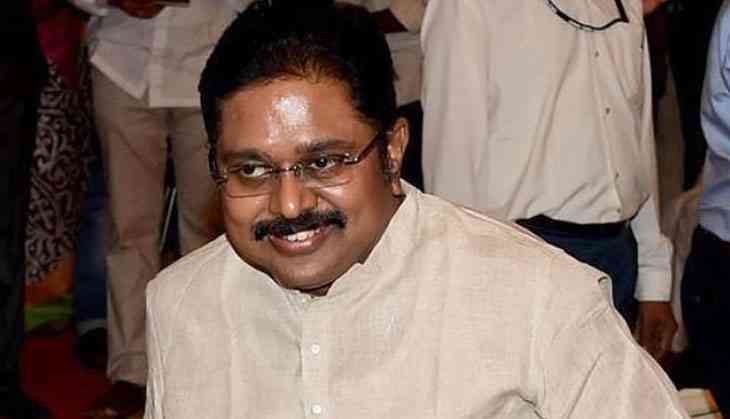 A defiant Dinakaran told reporters that he was appointed by Sasikala before she was taken to Bengaluru and lodged in jail in the disproportionate assets case. In an apparent reference to Prime Minister Narendra Modi, Dinakaran said the Palaniswami government is acting under pressure, with 'selfish motives', as it wants to stay in power. His return to Chennai has deepened the friction in the AIADMK Amma faction, with senior leaders speaking at cross-purposes. Senior AIADMK Amma faction leader and state finance minister D Jayakumar has said “we have nothing to do with either Dinakaran or Sasikala”, while higher education minister KA Sengottayan has said “only Chief Minister Palaniswami will decide on Dinakaran’s continuance in the party”. However, senior minister Dindigul Srinivasan has said there is no bar on Dinakaran resuming his party functions. He has maintained all along that Sasikala was appointed to the post by the party executive, and she cannot be removed by a group of ministers, a view echoed by another dissident leader, Tamilselvan. Why is Dinakaran in trouble? Dinakaran was arrested by the Delhi Police on 2 April for allegedly trying to bribe Election Commission officials to get the frozen Two Leaves symbol for his faction. He told reporters upon his release on bail, after spending 45 days in Tihar Jail, that he was very much in the party, and would decide his future course of action after consulting Sasikala. He was released by a Delhi court on bail last Friday, after the judge noted that the police were yet to identify the Election Commission official whom he tried to allegedly influence with a bribe. Dinakaran faced income tax raids in the wake of complaints of large-scale money distribution in the RK Nagar Assembly by-election, which he was contesting in order to enable him to take over the reins from Palaniswami. A diary seized by income tax officials at the residence of health minister C Vijayabaskar showed he had entrusted over Rs 20 crore to key ministers in the Palaniswami government. Following this, the election itself was cancelled. As Dinakaran continued to call the shots even after that, the Delhi Police arrested him and took him to Delhi on the basis of the alleged recovery of Rs 10 crore from Sukesh Chandrasekhar, a notorious power broker. While Chandrasekhar denied that he had been given the money to bribe the Election Commission, the Delhi Police arrested even Dinakaran’s friend Mallikarjun, who had accompanied him to the capital, and charged both of them with illegally transferring money through the hawala route. Once Dinakaran was out of the scene, it was reckoned that the two factions would work towards a merger. But nothing of that sort happened. Committees appointed by the two factions are yet to meet. While this case maybe politically motivated to get Dinakaran out of Chennai, he faces more serious charges of foreign exchange rules violations in the import of equipment for Super Duper TV for Jaya TV, in which his wife Anuradha continues to be on the board of directors. The case registered by the Enforcement Directorate in 1996 was dropped at one stage, and was revived recently. The ED court has said it will begin trial soon. With Dinakaran back with a bang, uneasy days may lie ahead for Chief Minister Palaniswami.